Not only is this fun (because what could be better than smearing a mud like substance all over your face? ), but it is also super healthy for your skin. And what could help you age like a Pro? Well, an anti aging clay mask of course! Our skin is under a constant battle. Stress, lack of sleep, dryness, dirt, the food we eat, and products we put on our faces are often working to make it tired and slack. IF we sleep great, don’t get stressed, eat amazingly healthy, cleanse, and avoid all toxic makeups and lotions, then we’re already off to a much better start. But…well, we aren’t perfect and busy lives happen. So, gather your friends, kids, husband, boyfriend, mother, or whoever you’d like to do this with, put on a nurturing anti-aging clay mask, and take lots of pictures for you to remember and laugh about later. What is fabulous about this recipe (besides it being full of anti-aging, nourishing, fun mud ingredients), is that the ingredients are really easy (and cheaper) to buy by in bulk. This way you have enough for a party (I wasn’t kidding. Throw that party!) and enough for you to use throughout the weeks to come. Apple Cider Vinegar will work as an astringent, balancing ph and shrinking pores. Raw Honey is soothing and full of nutrients that your skin will absorb. Honey has antiseptic properties (making it great for those with acne) and will moisturize your skin as well. Frankincense, Lemon,Essential Oil and Rose Hip Seed Oil are known for their amazing effects on skin. 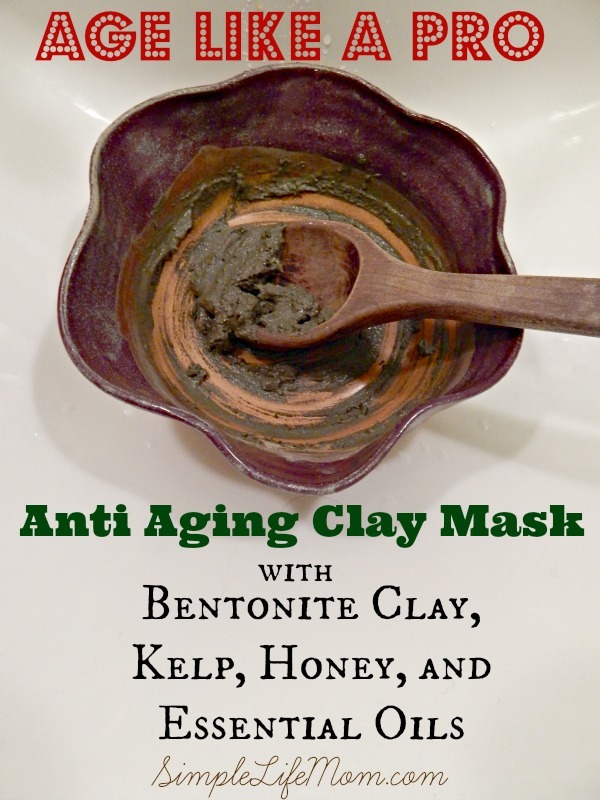 Bentonite clay, as aged volcanic ash, is great at absorbing toxins and extracting heavy metals. It is also calming to irritated skin (great for those with acne and other skin irritations). Kelp Powder is another detox, cleansing ingredient. It is also full of Omega-3s and polyphenols (great anti-aging powder for the skin). Down side – kelp stinks. It just does. But if you can ignore the seaweed scent, it will do awesome things for your skin. Anyway, you won’t smell it after you wash it off. 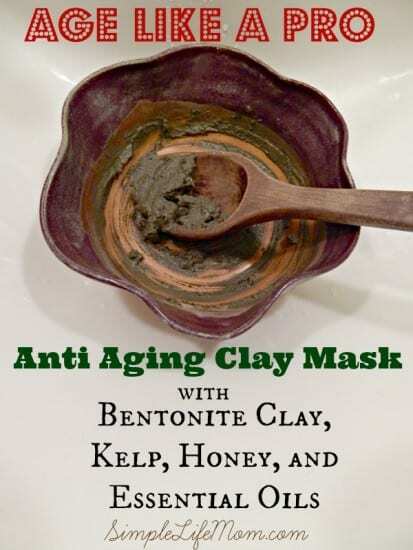 Combine apple cider vinegar, raw honey, rose hip, and essential oils in a non-metal bowl (bentonite clay reacts with metal). Add clay and kelp and mix with a non-metal spoon. Add water (or aloe) to make the consistency how you like it. Spread over a clean face with your fingers and allow to dry. Want more Anti Aging recipes? When I look at natural skin care recipes I’m usually looking for my daughter, who is just getting to that pubescent age when she will need to start taking care of her skin. THIS is a recipe I can use for me! I have a couple of these ingredients on hand now, and if I do make this mask soon I’ll be sure to send you my feedback. Thanks for sharing! Jen, my skin felt amazing after doing this so I hope you enjoy. I’ve been really into masks lately, but haven’t tried any clay versions yet. I’ll have to put this on my beauty-to-do list. I have very dry skin. is this mask ok for my skin. Yes, I have very dry skin as well. The honey acts as a moisturizer so you can use more of it and less Apple cider vinegar or water. Follow up with a good natural moisturizer. How often should you use the clay mask? You can do it once a week or once a month, whatever fits your schedule. I like to alternate with a good sugar scrub. It really does. You can add some tea tree oil to take it even further. Hello, I’m so looking forward trying this recipe… one question though: is rosehip seed oil the same as rose hip essential oil? thank you. Today I finally got all the ingredients to make the mask. I’ve just rinsed it with warm water, and my skin feels super clean and extremely soft. I have to admit, it was SOOO hard putting up with the fishy smell : p… but I think it was all worth it ! I applied some homemade lavender hydrosol to help me sleep through the night and my favourite cream from the Mountain Rose blog. As I was putting all the ingredients together, I wondered why it only took one single drop of some of the oils. I asked myself if it really made a difference, and I was tempted to use more. If you could send me your comments on this. If you buy essential oils that have been grown and harvested in a high quality manner, then you will have essential oils that are potent. I’m always tempted to use more because they smell so good :-). This is wasteful though and can even burn your skin, depending on the oil. I try to remember that just inhaling the scent can have effects on the body, so adding a few drops directly to the skin has an even bigger effect. A little bit goes a long way. 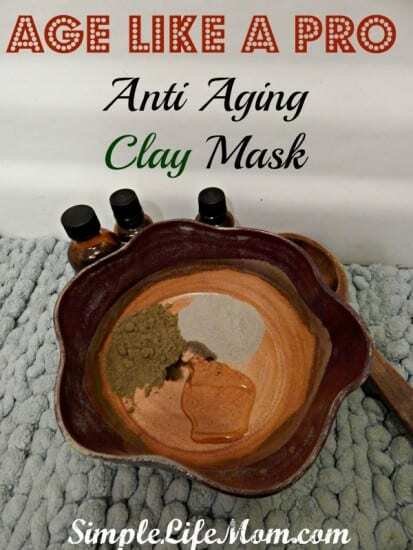 Do you think that you will be adding the “Anti – aging clay mask” to your Easy store? I made your anti aging serum and I love it, but it seems to be aggravating my adult acne. I’m continuing to use it for the areas of my face that aren’t acne-prone. I used rose hip oil as the carrier. Is there a better noncomedogenic alternative or are essential oils by nature comedogenic? Thanks! People will often list which oils are noncomedogenic and which ones are, but it really varies depending on your own skin and how you respond to those oils. If Rosehip causes you to break out, you can try grapeseed, apricot kernel, or sweet almond oil. Hemp seed oil is very good for the skin is known to not clog pores. I would choose one that I want to try and use it without the essential oils first, and then if it seems to be working, add the extra oils. Thanks for your advice; I’ll give those a try. My 11 year old daughter & I just did this mask. My skin feels amazing and I will do this mask regularly! My daughter, not so much. She said she smelled like a touch tank. Haha. I will make it w/o the kelp for her from now on. We also made your lemon sugar scrubs last week and love that as well. Thanks for sharing your wonderful recipes! Can you store this over a period of time? It will store air tight for a month or more, but any bacteria introduced can cause the oils to go rancid faster. This sounds great. Can I substitute activated charcoal instead of kelp? Yes , activated charcoal will work wonderfully. Kelp is so good for the skin, but it is stinky ? Can you replace kelp with spirulina or Chlorella? I wonder if this anti-aging clay mask is suitable for a 20-year old? I’ve been using this clay mask a couple of weeks now and my skin feels great. My younger sister wanted to try this one too. Is it okay for her skin because she is in her early 20’s. Yes, she can definitely use it. Everyone’s skin is different though so still test for an allergic reaction by applying a spot to the wrist first and letting it dry. Rinse off and if there’s no problem then she’s good to go.